Kawaii, cute love heart badge. 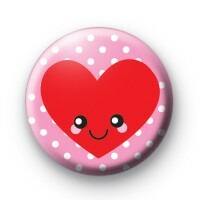 This pink and white 25mm polka dot badge has a happy smiley red love heart in the centre. It is a super sweet badge to give as a gift to a friend or loved one. Or to pin to your school uniform or coat to jazz it up and spread some positive vibes. We have lots of love and romance themed badges in the shop so if you have a club, or party they would make perfect keepsakes.